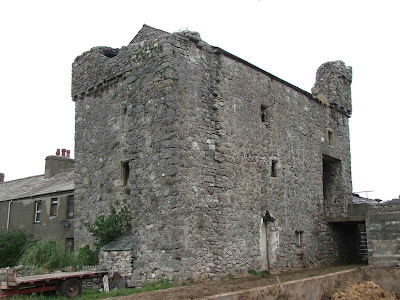 Wraysholme Tower is about two miles outside of the village of Allithwaite in Cumbria, just off the B5277. 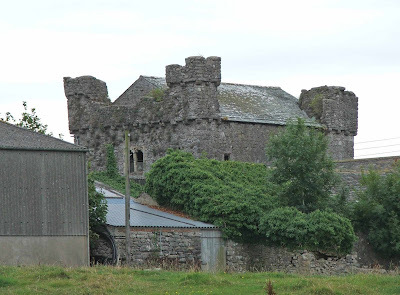 The tower was built by the Harringtons, a powerful local family in the 14th, 15th and 16th centuries. 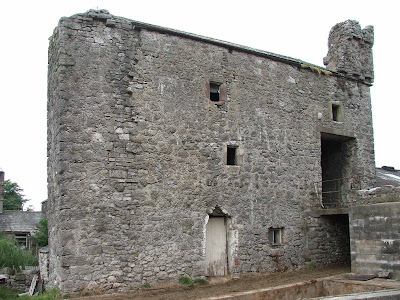 The tower would once have been attached to a hall house, but this medieval building has long since been replaced by the building seen today...built in 1848. Some of the walls in the this building are thicker than one would expect, suggesting that some of the earlier building was incorporated into the mid 19th century rebuild. 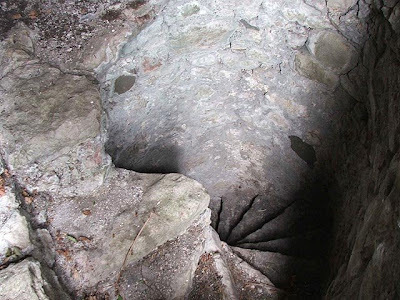 The photo above shows the still surviving, and still usable, stair case. 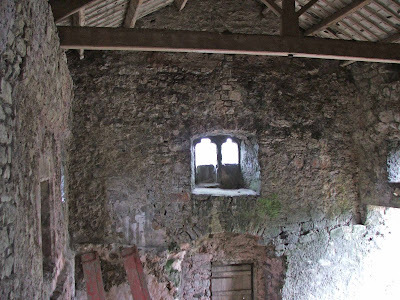 This is hidden in the South West wall corner and provides access to the first and second floors, and finally the roof. 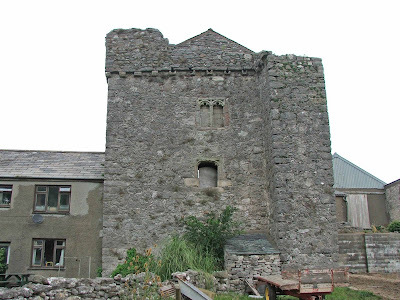 The photo above shows the South facing wall of the tower, with the stair turret hidden in the left hand side wall of the tower. The projection on the right hand side of the tower is the garderobe tower. The small bartizan is missing from the right hand tower. 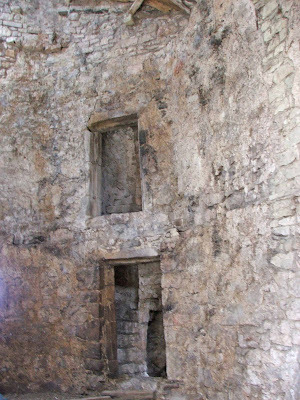 The tower's walls are around 1.4metres thick, and all in all it is in good condition. 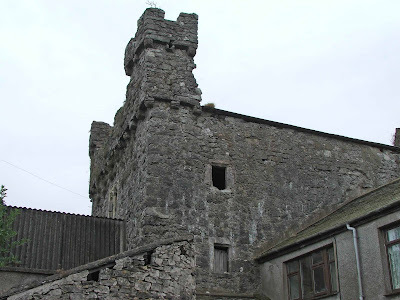 The tower was originally three storeys tall, with battlements and turrets. A fire a few years back resulted in the flat roof being replaced with a steepled roof, and much of the interior being destroyed. In the book "The remains of John Briggs" by John Briggs we are told that "an intrepid knight, named Harrington, fixed his residence at Wraysholme. He erected the tower, which alone remains to mark the spot where he passed his days. He constructed the walls of stones, and cemented them with lime and ox blood, designing them to exist till the world itself should sink in ruins." The book goes onto to explain how Sir Edgar Harrington was responsible for the death of the last wolf in England (according to legend) when he managed to slay a wolf that was living in the forests of Cartmel, when it was trying to attack a 'fair young maiden'. The small bartizans would once have been seen at all four corners of the tower's roof, but the South Eastern one has been destroyed at some point. These small tower pinnacles would most likely have been for show rather than for any defensive use...giving any visitors a grand view of the tower as they approached it from a distance. The tower can be viewed from the road at fairly close quarters. I was lucky on the day I visited, as the farmer kindly agreed to give me a brief guided tour, resulting in a climb to the top of the tower. Climbing to the roof, the small bartizans can be seen at close hand. Although there would once have been a roof\wall walk, the new\recent roof means that this has all but gone. 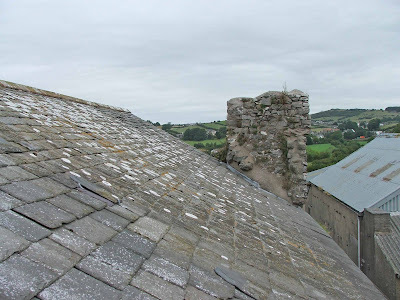 Now only one side of the roof walk is passable...but from here, three of the towers corner bartizans can be viewed. This interior view demonstrates that the second floor has been removed and the whole tower, now used as a vehicle store, is open from the first floor to the roof. The banked entrance to the right of the photo above, is recent, and makes use of an entrance knocked through the wall in recent years. This view shows the tower butting onto the 19th century hall\house. This great view shows the stair case buried in the interior of the wall. As mentioned above, the stair case still allows access to the first and second floors and the wall\roof walk. 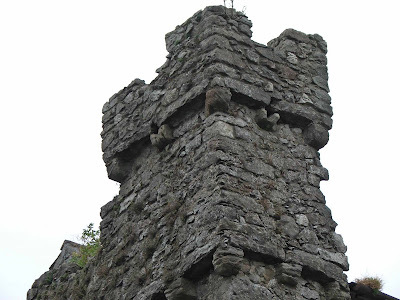 It's likely that this tower was built as a show of status by the Harrington family. The lack of any vaulted basement indicates that defensibility was not a primary function...and that it was most likely built as a manorial site, designed to be visible to all who visited and to indicate the family's power and local political sway. The tower can be viewed from the roadside, although a winter or autumn visit is recommended as the hedges and trees at the roadside can form a thick barrier against good views. It's an astonishing building particulrly if you're not expecting it. Thank you for the additional photos - we could nly see it from the road and were amazed . Hi, my name is Paul Commander. I am the proprietor of The Toy Works in Melmerby, Cumbria. Some years ago I was commissioned to make a model of 'Wraysholme Tower Farm' for the son in-law of the farmer at Wraysholme.